THE country’s largest union is set to ”consult widely” with its members about pay rises offered to nurses to halt strikes this week. Siptu has indicated that it will examine the potential for knock on claims as a result of proposals put forward to resolve the dispute. In a statement, it said it will be “consulting widely” with members in its health division and others across the public service in local government, education and state bodies. 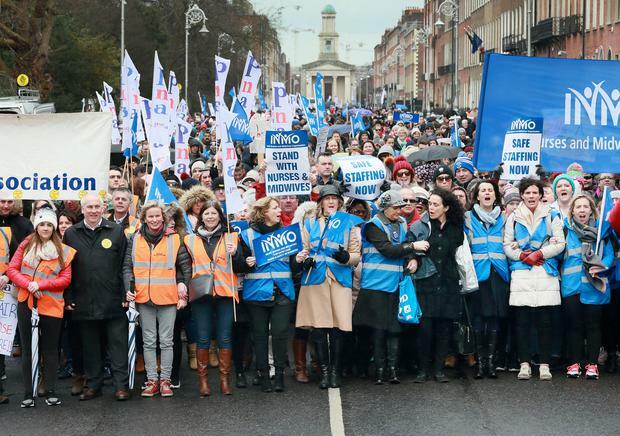 The union is referring to a Labour Court recommendation to resolve the row after nurses demanded wage hikes. The proposal includes a new higher pay scale for nurses. SIPTU representatives will meet the Public Service Committee of the Irish Congress of Trade Unions in the coming days to discuss the recommendation. Siptu deputy general secretary, John King, said members in health and other public services will engage in consultation on the implications of the Labour Court recommendation arising from nursing unions’ claims. “We have noted the statement by the Government that the proposals outlined in the Labour Court recommendation are consistent with the terms of the Public Service Stability Agreement,” he said.